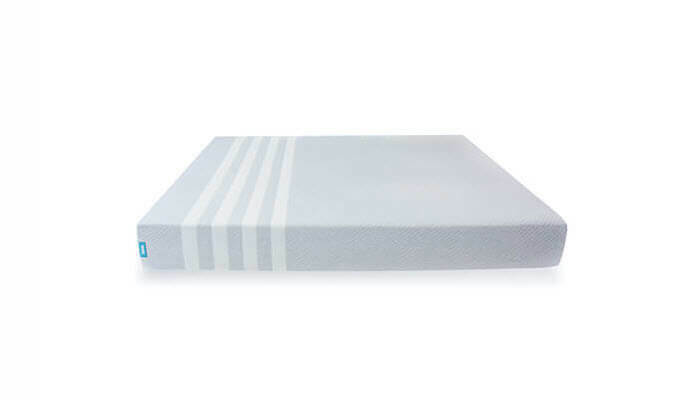 In this review, we will be overviewing two newcomers to the foam mattress industry. It is only in recent years that various companies have entered the market segment to offer customers a range of different mattresses at much more affordable prices than traditionally available. 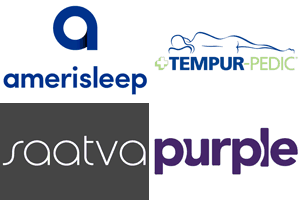 Two of these companies are Leesa and Helix, who have both been able to offer wonderful mattresses through their online stores. They have aimed to fight major foam mattress providers such as Tempurpedic. If you’re considering purchasing one of these two mattresses, this is the perfect review for you to take a look at. It has all the information that you will need to make the right decision when purchasing your next mattress. Choosing the right mattress is not a decision that should be taken lightly, it’s the difference between good and bad sleep for the foreseeable future. Helix has truly revolutionized the foam mattress industry. They’ve set themselves apart from the competition using one tried and true technique – customization. The majority of online mattress producers make you stick to a single mattress type, but Helix allows you to customize your mattress completely so it is suited specifically to your wants. They are able to achieve this through an online survey that you fill out during the initial phases of searching for a mattress on their website. This survey takes into account a range of different factors to determine which mattress type is best for you. All Helix mattresses are manufactured inside the United States – by purchasing a Helix mattresses, you are also helping local workers. If you buy a Helix mattress, you can return it within the first 100 days of use completely free of charge. This way you don’t have to take on any risk when you purchase their mattresses. In addition, the mattress has a 10-year warranty which is in-line with industry standards. If you live in the United States, shipping is also free of charge. 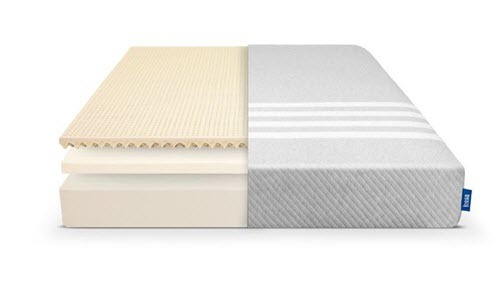 Most Helix mattresses are constructed using four different layers of advanced foam. 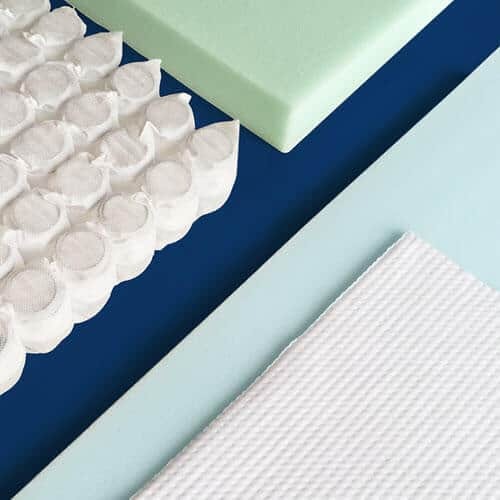 This allows for them to truly customize the mattress and the way it feels – it’s the best possible way to ensure that you receive the benefits of multiple materials. This layer is typically made from poly foam – Helix have their own poly foam called Helix Dynamic Foam. This has similar traits to latex – this means that it is quite responsive. This layer is constructed from microcoils, which provides additional softness as well as responsiveness. Again, this layer is constructed using poly foam – Helix Dynamic Foam again. This is an additional support layer. This is the support layer of the mattress, it is made from high-density advanced foam. Remember, these layers will be in place in different proportions depending on the exact type of mattress that you purchase. These different types will be explored in further detail below. 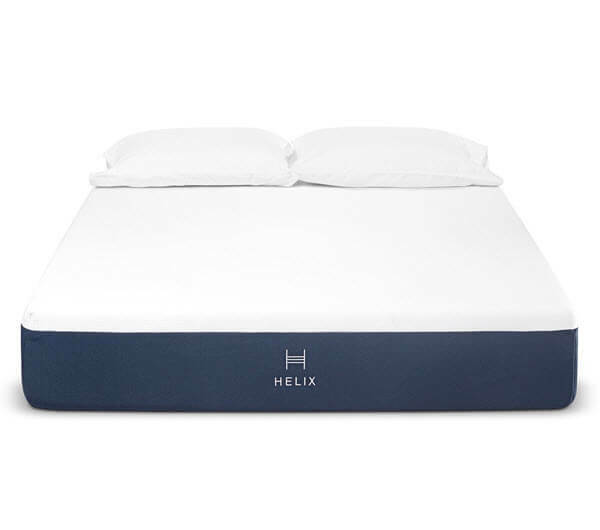 The Helix cover doesn’t deviate much from the traditional foam mattress covers that have grown popular in recent years. It is made using 100% polyester and therefore has a very durable composition. It is extremely thin – this is done in order to prevent too much distraction occurring because of the cover. Helix wants you to interact as much as possible with the mattress itself. As mentioned previously, Helix has been designed to provide the most custom comfort possible to its owners. You will find that there is no other mattress provider that is able to offer this degree of customization – it truly is unbelievable how different some of their mattresses can be should you have certain preferences. Support – As always, Helix will be looking to see how much support your body type will require in order to deliver an enjoyable sleeping experience. This is a no brainer. Feel – This is how hard you want the top of the mattress to be. 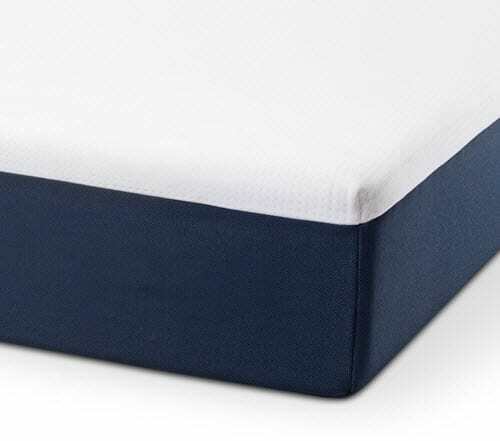 Point Elasticity – This is how much contour is provided by the mattress. The Tempurpedic Cloud is a good example of a mattress type that uses this extensively. Temperature Regulation – This will determine how breathable your mattress is. If you have a hard time sleeping due to overheating, this will be a vital component for your mattress. There are a huge number of different mattresses that you can get from Leesa, but we’ve narrowed it down to a few different mattress types just so you can have a better idea of the diverse options available to you. Many mattress producers have a single mattress type that is used for all their customers – if you don’t like this mattress, then you won’t be able to purchase a mattress from that company. One of the biggest factors that determines the viability of a mattress is its support. But Helix has support scores that range from 3/10 to 9/10 – you really should be able to find a mattress that suits you perfectly if you’re looking to get a Helix. Below we will overview four common mattress types that Helix customers end up ordering. This mattress comes in at a 5/10 in terms of firmness – it scores right in the middle. This means that you will be able to have a comfortable sleep without feeling too much resistance from the mattress itself. It’s important to make sure that you know whether or not this mattress will be able to lend you the support you need to have an effective sleep. This is another great mattress for people of a normal weight distribution. It gives you a bit more support than the first one, but still prioritizes the level of comfort that you’ll be able to receive. This is definitely a great option for those who are light and want a comfortable sleep to relieve stress or pain. This is a 5.5/10 in terms of firmness which is a little more support than you’ll get from the first mattress, and slightly less than the second. Again, a great mattress for those with normal weight distributions. This is the most firm of the mattresses that we’re mentioning. It’s intended for those who are heavy sleepers. If you’re a lightweight, you may find yourself feeling as though you’re sleeping on top of this mattress, which can be rather unsettling. In addition to these mattress types, you can also get a blended or split mattress. A blended mattress means that it takes both you and your partner’s considerations into account. A split one means that the bed is split in half to have two separate blends. Like Helix, Leesa is only a relative newcomer to the foam mattress industry. But this hasn’t stopped the company from achieving miraculous growth rates in recent years. The Leesa mattress has been able to corner a market share due to the comfortable reputation it has. Leesa manufacturers all of their mattresses right here in the United States. If you do purchase a Leesa mattress, you’ll also benefit from a range of additional perks. You will get your mattress shipped free of charge with a 10-year warranty. In addition, if you decide you don’t like your mattress, you can return it free of charge within the first 100 days of ownership. 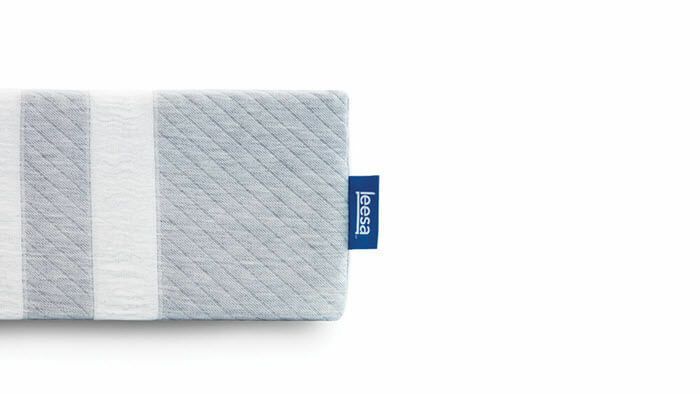 The Leesa mattress uses three different foam layers to construct their mattresses. In this regard, it is slightly more basic than the Helix mattress. In addition, there is only one mattress to choose from, so you may find they are not suitable for you. This is made using Avena foam – an advanced foam designed by Leesa to be both comfortable and breathable. This part of the mattress is 2” thick. This is the second layer of the mattress, it is also in place for comfort. It consists of 2” of memory foam. This layer of the mattress is only in place to provide optimal support. It is the foundation of the rest of the mattress. You’ll find that it consists of 6” of high-density foam – plenty of support for the rest of the mattress. Leesa uses a polyester-lycra blend to construct their covers. The entire cover is then made of one large piece of material which is used to shield the entire mattress. The cover is fairly minimalist, it doesn’t want to end up contributing to heat retention. You’ll find that the cover does its job perfectly. One of the first things you should address when deciding on a mattress is whether or not it offers enough support to you. You’ll probably find that the mattress actually does offer a fair bit of support, especially if you happen to be of a regular weight class. We’ve scored this mattress at about a 6/10 in terms of firmness. If you do find that you weigh more than usual, this is probably not the best mattress for you. A company like Helix will be better suited to provide you with a supportive mattress that meets your needs better. There is no denying that the mattress is extremely comfortable. One of the primary reasons that Leesa has managed to be so successful is that it has one of the most comfortable and affordable mattresses on the market. Sometimes it’s easiest to take a look at things in a more concise manner when trying to compare two similar products. We’ve created the table below to give you a better idea of how these mattresses truly stack up against one another. Both mattresses allow normal consumers to access the once exclusive foam mattress market. If you’re looking for a good deal, both companies can provide you with one. If you’re thinking that the Leesa is the perfect support level for you, it’s probably the better option as it is cheaper and has great customer feedback. But if you’re someone who is unsure about what type of mattress is best suited to them, taking the Helix survey online and exploring your options is an awesome way to try and get a better understanding of which mattress is right for you. In addition, having a wide variety of mattress choices means they’re bound to have something for you. They can even split your mattress in half if you and your partner have different preferences.